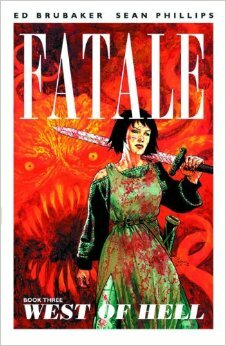 This entry was posted in Comics, Graphic Novels, Stokers and tagged Dave Stewart, Ed Brubaker, Fatale, Fatale Book Three, Graphic Novel, Sean Phillips, West of Hell by Mr. Dreadful. Bookmark the permalink. I hopped on the Fatale bandwagon several months ago, reviewing issues for I Smell Sheep, and it’s been a noir-ish delight with every issue. Love it.